How Are Shoulder Rivets Used? Based on the specific requirements for your project, you may need a certain type of rivet. Among the various types of rivets available today is the shoulder rivet. This type of rivet is unthreaded and features a headed pin. Shoulder rivets are used when it is necessary to join two or more parts together by passing the pin through the holes that are drilled into the individual parts. A second head in the pin is then formed on the opposite side of the material. In order for the head to be formed on the pin's plain side, direct pressure is usually applied. Once a shoulder rivet has been deformed, it is not possible for it to be removed without breaking one of the heads. For this reason, shoulder rivets are often preferred for applications in which security is essential. These types of rivets are also commonly used for hinging or pivoting joints. Shoulder rivets may be a tubular or solid rivet that features a shoulder located under its head. Such rivets are commonly installed so that the shoulder is able to serve as a bearing surface. This makes it possible for the retained part to actually pivot. In selecting shoulder rivets, it should be understood that while the head of the rivet is not necessarily limited to a certain shape, it is imperative to make certain that the shank of the rivet is long enough in order to accommodate the thickness of the material that is to be joined. When the materials are particularly thick, an even longer shank will be required. In addition, there must be enough length in order to allow for the formation of the clinch head. Not all rivet suppliers handle shoulder rivets. This means it is even more important to pay careful attention to the selection of rivet supplier when you require shoulder rivets. 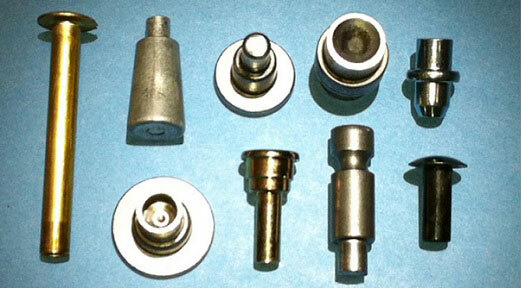 In choosing a supplier, make a point of asking whether the supplier specifically handles shoulder rivets. It is also a good idea to inquire about the types of materials available for the production of shoulder rivets.